Schematic diagram of the planned rover components. The Mars Science Laboratory (MSL) is a NASA mission to land and control a rover named Curiosity on the surface of the planet Mars. 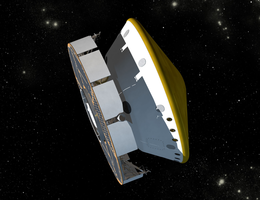 The MSL was launched on November 26, 2011. The MSL successfully did the first-ever precision landing on Mars. It landed on Mars at Gale Crater on August 5, 2012 and began exploring the surface. The goal of the Curiosity rover is to study the history of Mars. It was to see whether Mars has, or ever had, an environment able to support microbial life. It indeed did that, finding evidence that 3 Billion years ago there was once water and a life-supporting environment. It is important to know that it found that life COULD HAVE existed, not that it certainly DID. It will also carefully look at samples scooped up from the soil and drilled powders from rocks. Curiosity is five times as heavy as the Mars Exploration Rovers Spirit or Opportunity and carries more than ten times their mass of scientific instruments . It was launched by an Atlas V 541 rocket. Curiosity will be expected to work for at least 1 Martian year (668 Martian sols/686 Earth days), but may live a lot longer than that. It will explore Mars with greater range than any other rover. Mars Science Laboratory mission is part of NASA's Mars Exploration Program. The program is a long-term mission of robotic exploration of Mars. The Jet Propulsion Laboratory of the California Institute of Technology manages the program for NASA. The total cost of the MSL project is about US$2.3 billion. ↑ Klotz, Irene (November 24, 2011). "New NASA rover to scout for life's habitats on Mars". Reuters. Retrieved May 5, 2015. ↑ Wall, Mike (August 6, 2012). "Touchdown! Huge NASA Rover Lands on Mars". Space.com. Retrieved December 14, 2012. ↑ "Video from rover looks down on Mars during landing". MSNBC. August 6, 2012. Retrieved October 7, 2012. ↑ Young, Monica (August 7, 2012). "Watch Curiosity Descend onto Mars". Sky & Telescope. Retrieved October 7, 2012. ↑ "Name NASA's Next Mars Rover". NASA/JPL. 2009-05-27. Retrieved 2009-05-27. ↑ "NASA Selects Student's Entry as New Mars Rover Name". NASA/JPL. 2009-05-27. Retrieved 2009-05-27. ↑ Kaufman, Marc (November 19, 2011). "A mission of Curiosity". Washington Post. p. A1. ↑ "Mars Science Laboratory: Mission". NASA/JPL. Retrieved 2010-03-12. ↑ Watson, Traci (2008-04-14). "Troubles parallel ambitions in NASA Mars project". USA Today. Retrieved 2009-05-27. ↑ Chang, Kenneth (2008-12-04). "NASA Delays Next Mars Rover Mission". The New York Times. Retrieved 2009-05-27. ↑ Kaufman, Marc (2011-11-21). "Landing on Mars is hard, but another mission to the Red Planet is about to begin". Retrieved 2011-11-22. M. K. Lockwood (2006). "Introduction: Mars Science Laboratory: The Next Generation of Mars Landers And The Following 13 articles" (.PDF). Journal of Spacecraft and Rockets 43 (2): 257–257. doi:10.2514/1.20678. http://pdf.aiaa.org/jaPreview/JSR/2006/PVJA20678.pdf. Wikimedia Commons has media related to Mars Science Laboratory. MSL - Demo, reported by The Planetary Society. This page was last changed on 28 February 2018, at 16:58.